20130923 - Up in the am for an early meeting. Worked all day and then headed home. LJ&G were waiting for me and we ran the black car down to Tuffy to drop it off and have them give me a 'second opinion' on the frame work we had done. 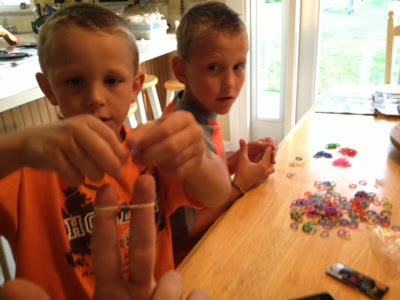 Home and we ate and the J showed us how to make the new craze ruber band bracelets. I ran to pick up D from baseball practice and then we stopped at Scouts. At Scouts we coordinated the painting of the baseball buildings at Jefferson and then headed home. D ate and I shipped ebay sales. I put the little boys to bed and then headed to Bible Bangers. It was a small group tonight so we ended early. Home and Jeff stopped by and we finalized how we are going to move fwd. to bed late and then J up in the middle of the night.